Chic and sleek, this bold necklace in black is the ultimate wooden jewellery to wear with that little black dress. The dramatic new design by Aarikka has a modern flower shaped pendant made from sustainable wood with silver-coloured decoration. Bold and feminine, this sophisticated black necklace will complement your outfit as oppose to overpowering it. 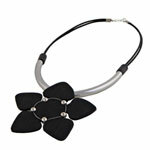 It is the perfect black necklace for creating an impact at parties, weddings, evenings out and formal occasions. Beautifully crafted from sustainable wood, this modern necklace is light to wear, silky to the touch and long lasting. It will complement a variety of outfits whether you are opting for smart casual or black tie, making it a versatile necklace for any jewellery collection. 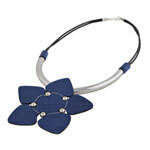 As well as classic black, this flower necklace also comes in fresh blue. The black necklace will add the finishing touch to a monochrome outfit or create a striking contrast when worn with white, red or bright coloured clothing. The blue necklace has a slightly lighter, more summery feel and is perfect for eye-catching feminine sophistication. Wear the blue necklace with denim, navy, white or red.